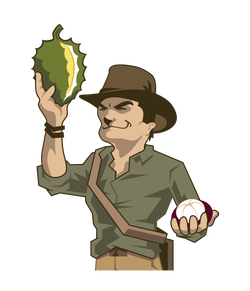 ﻿The tropical fruit hunter dude and I welcome you all to our site. This is a site dedicated to me﻿n and women w﻿ho hunt for tropical fruit all across the globe. Busy summer repairing more water damage to greenhouse and home. Here is a link to my latest blog covering the project: Summer Fun 2018. So check it out! I've also finally updated the galleries so check them out. Help save Puerto Rico agriculture. ​So much devastation from the storm. All those beautiful farms we visited over the last nine years...gone. Most of the pictures and stories on this site are from my trips to Puerto Rico and Ian Crown's farm in particular. No one likes to ask for money, but there are times when you are left with no choice. This farm has been good for agriculture, the community, and the economy of PR. It has been one of the grandest spots for rare fruit hunting I've been to. I believe it can once again be all that it was. Please click on the following link to take you to Ian's GoFundMe site...and help if you can.